Some of your peers may have declined to go to Virtual Desktop, others are well in trenched and couldn’t imagine going back to distributed desktops. Why do some enterprises see value and are early adopters and others just don’t see it (now or in the future?) Is there a magical recipe you follow to go virtual? Can you do something to avoid potential pitfalls? 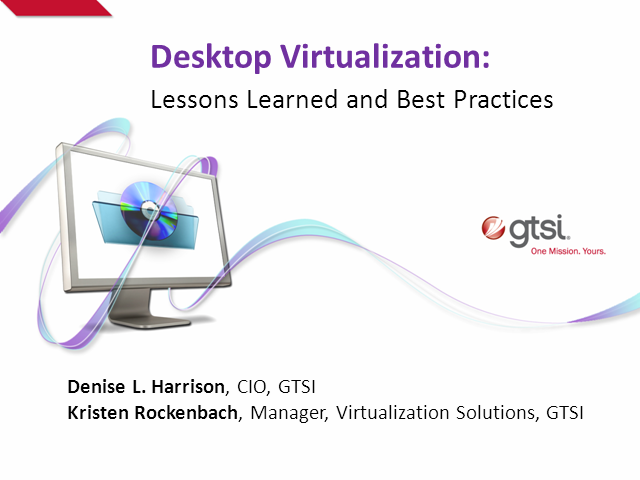 Denise Harrison, CIO at GTSI Corp. and Kristen Rockenbach, Manager, Virtualization Solutions at GTSI Corp., will share their experiences and best practices to help IT decision makers plan for a successful transition. Denise Harrison, Chief Information Officer, GTSI Corp. Presented by: Denise Harrison, Chief Information Officer, GTSI Corp.